What is the Project Quality Management Plan? 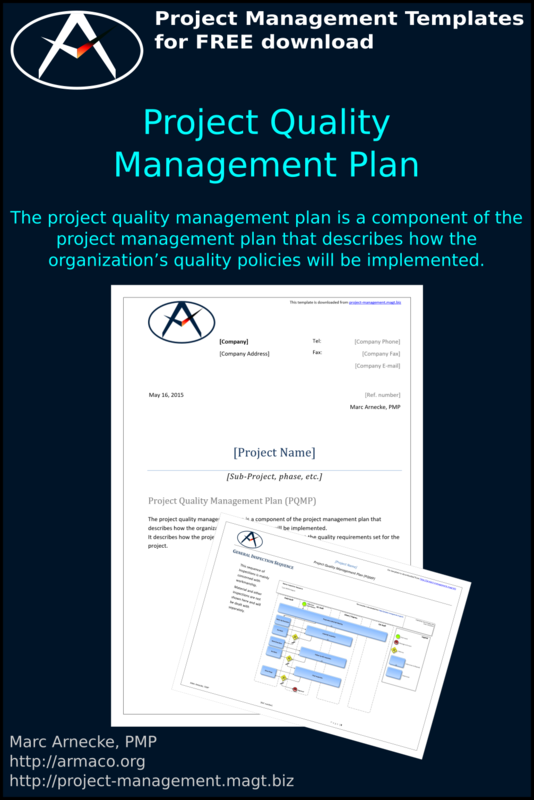 The project quality management plan is a component of the project management plan that describes how the organization's quality policies will be implemented. What are the Contents of a Quality Management Plan? The plan contains the procedures how individual components and materials will be tested for their suitability and permissibility for the project prior to their approval and use. The plan also contains details of how and how often certain components or workmanship are inspected or tested, and what immediate measures to take in case of deviations, etc. The plan further contains the details of how a finished product is tested at the end and put into operation. never emailed the template… moving on… bet my email is off to the highest bidder, THX! It is against the policies of this website to sell email IDs. I am not doing that and will not in the future. I am sending updates about new and reviewed templates and new articles not more than once a week. Dear visitor, unfortunately, my templates have been linked directly by other websites and all hints regarding their origin have been removed. I have therefore decided to change my website and to send download links by e-mail. I ask for your understanding. Thank you very much for downloading my template. The download link has been sent to your email address. If you can’t find the email, please check the spam folder or the promotions folder (if you are a Gmail user) and either white-list the email or drag it to your inbox. Please leave a comment at the bottom of the page and kindly like/share my website on social media if you want to support me. This site uses google analytics to monitor site usage.